Welcome to my Sit Down Saturday! Grab your cup of coffee or tea and get comfy because, instead of an interview format, I'm going to tell you about a scary, real life, childhood experience that made its way into my May release, THE TWIN TEST (book 5 of 6 in my 'From Kenya, With Love' series) . In book 4 of the series, EVERY SERENGETI SUNRISE, Pippa is caught up in a love triangle that leaves her heartbroken and unsure of who she really is as an individual. Have you ever felt lost...like you didn't know what your purpose or destiny was or what you wanted to do with your life? I know I've been there. Funny how sometimes the signs of 'who' we are are there all along and I think I always knew Pippa would become a teacher...though I honestly had no clue who her hero and soul mate would be. That was a tough one! I'm inserting a few pics of myself to prove the point. After taking a circuitous path (and trying other careers) to becoming an author, I think the signs were there all along ;). Rula reading (I think that's a Highlights magazine!) 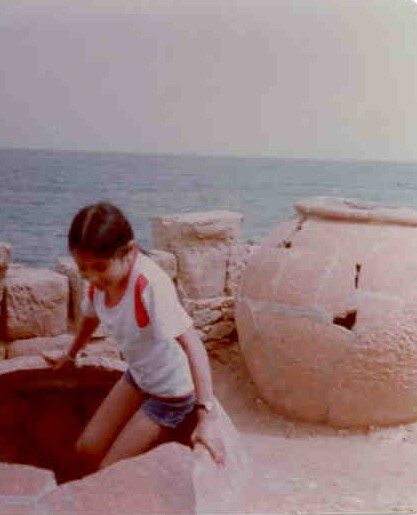 in the backyard of her family's bungalow in Algeria, in a small town right on the Mediterranean sea in the 1970's. Rula with her nose in a book...again. THE TWIN TEST has several significant themes in it: education (especially of girls), teaching off-the-grid in areas where kids might not otherwise have access to schooling, the importance of learning to read, fracking and its dangers, well water contamination and its health/developmental impact on children, man's impact on the environment, family, love, coping with devastating heartbreak, including the loss of loved ones and environmental disasters. Whew! I know that sounds like a lot, but it's all related and interwoven in the story. You'll see! In fact, I tapped into my own life a little with this story. 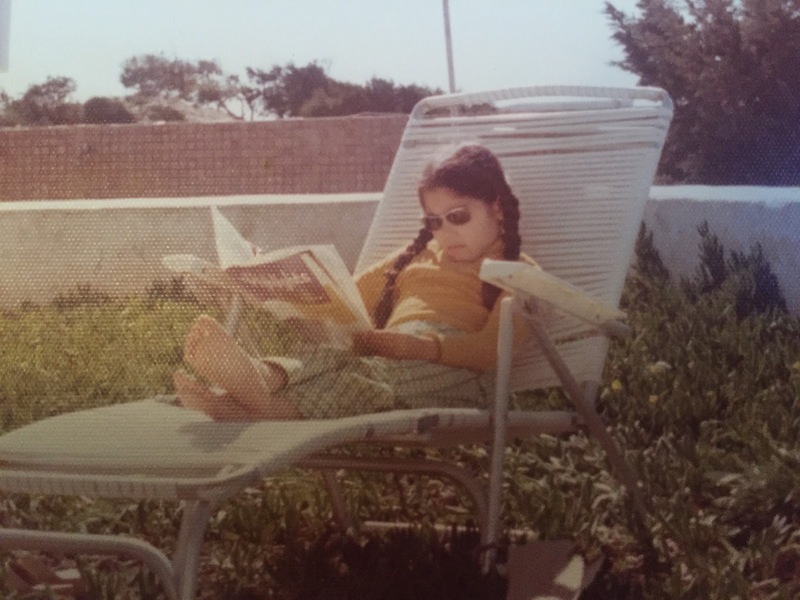 For one thing, like Pippa, I was always an avid reader, loved wildlife (chimpanzees were my favorite animal as a little girl and I wanted to be Jane Goodall...or the Bionic Woman). Secondly, though not in Kenya, I did live in North Africa and have gone on adventures in the Sahara Desert. Thirdly, I actually tapped my dad's brain for the story. As a petroleum engineer who worked in various countries in Africa, he was able to give me first hand details on life in the field, how geologists hired by oil companies work etc...(of course this is a romance so I took some literary license and if there are any factual mistakes, they are of my own doing...though I tried to keep everything as real as possible). And lastly, the destructive El Asnam earthquake of 1980 happened while I was reading in the same backyard pictured above. An experience I'll never forget and one that I drew from while writing this story. I didn't live in El Asnam, but the town was close enough for strong tremors to be felt where I was (a small ocean-side town about an hour from Algiers) and families from our expat community and school rallied to collect relief supplies and donations for the devastated town. El Asnam had basically been reduced to rubble...including a girl's school...and people were trapped for days. I don't want to give spoilers for the book, so what I'll do is tell you a bit about what happened and what I witnessed and you can see if you find those specifics in the book ;). On that day, I had a friend over and we were reading comics in my backyard. I was lying on my belly, reading, when I literally felt the ground beneath me ripple like the waves I played in daily at the beach. It made no sense. Ground was supposed to be solid. Earthquakes were the last thing on my mind and I'd never experienced one before. The sensation only lasted seconds and everything went back to normal. Not long after, my friend and I went next door to visit another school mate. While in her bungalow kitchen, I recall looking at a glass of water on the counter and noticing that, although the glass seemed perfectly straight, the water in it was at an angle. That made no sense either! Just as I pointed it out to the others, the totally in-style macrame plant hangers started to sway and my friend's mother started yelling for everyone to get outside. She knew it was quake and ran out to alert everyone in nearby bungalows. It wasn't long after we experienced those strong tremors (tremors that continued for weeks) that we found out that the epicenter had been at El Asnam. I used to write a lot of poetry and wrote a poem about it in school at the time...a poem that got lost but I wish I still had. The Great Rift Valley runs along western Kenya and is largely responsible for the earthquakes felt in bordering Uganda to Tanzania (I'm giving links for those interested). Those quakes have been stronger than the ones felt in Kenya, though Kenya routinely gets smaller tremors and quake events. The thing is, it's a high risk area due to the tectonic plates that merge in that region. In fact, a few interesting articles include: Why This Giant Crack Opened Up in Kenya and What would happen if an earthquake hit Kenya? (referring to a massive one, as opposed to the 3-5 mag quakes that have happened in recent decades). That article touches on the same issue that happened in El Asnam: housing and buildings that aren't made to withstand a quake...even a smaller one. Often, small rural school houses (like the kinds used by missionaries in some places) are not reinforced. Plaster, concrete and even Masai mud huts aren't built for quakes...a dangerous and life-threatening fact. So to throw another factor at you...what about the increase in tectonic activity that has been recorded in places where the oil industry uses fracking? You can see where all of this will tie into the story. And as you might be guessing, Pippa Harper taking on the role of teacher for widowed seismologist Dax Calder's unruly, identical twin girls in Kenya's wild Rift Valley region is a dangerous, yet romantic, experience that's bound to shake up her life and heart...literally. 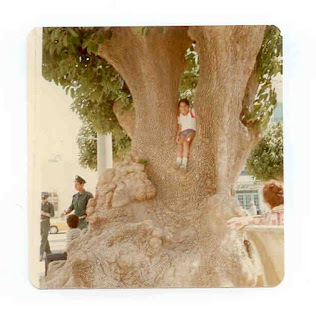 Rula up in a tree in Algeria...because, yes, maybe she was a little monkey like Pippa when she was a kid. CLARIFICATION: I’m not sure where the 'rumor' started, but this isn't the final book of the series. I saw this mentioned in a couple of reviews and I did do something different for the epilogue...something that would have made for a beautiful end to the series (you'll have to read it to find out (laughs mischievously) ;))...which may have led to the assumption (so it's on me), but there is one more book in the works and I promise it'll be an exciting last book of the series! I'm currently working on book six, targeted release Jan 2019/title coming soon. In fact, I'm working on revisions for it now! And no, rest assured, it won't be the last book I write...just the last in this series. I do have three more books for a new Heartwarming series in the works. This final story in my 'From Kenya, With Love' series will center around Maddie’s younger brother, a wounded marine who finds himself protecting a pregnant, widowed nurse who runs a rural clinic in the wilds of Kenya. Though the characters are connected and readers have told me that reading the whole series provides and even richer experience, each story does stand alone and can be enjoyed on its own. I hope you have the chance to enjoy The Twin Test this month, and perhaps spend some time in Africa this summer, as you catch up on the rest of the series ;). Available now in ebook format (May 1, 2018) and paperback (May 8, 2018)! I loved those childhood photos, Rula, and you definitely followed that early calling to literature. Your new release sounds as wonderful as the rest in the series and I look forward to reading it. Congratulations! Thanks, Janice! Polaroid cameras were big back then and I had to take cell phone pics of our old Polaroid printouts ;). Thanks so much for the photos and the stories and the description of the region's natural world and all the current threats to it. Glad to hear this isn't the final book! It's an honor sharing a release month with you. It's an honor to share the month with you too, Virginia! So glad you liked the post. I could have gotten deeper into the geology of the region, fracking etc...but that would have been way too long of a post ;). I really hope everyone enjoys the story! And the cute comic relief from the twin's antics ;). I love the pictures (especially the first one where you have your ankles crossed as you read!) and the story behind the story of your book. Hey Marcie!! So great to 'see' you here and glad you enjoyed the pics and post! I'll admit I had fun looking through old photos :). It's amazing how time flies, yet I still recall the time I spent in Algeria like it was yesterday...from sound to smell to all of my senses. Especially the feeling of earth rippling like a liquid! Rula, what a wonderful post and what a rich life you had at a young age. You've touched two subjects dear to my heart--environment and care of endangered animals. I lived through a couple of bone-shakers, one in L.A. the other in Seattle. They are scary. The one in Seattle brought cars through the windows of the below street office where I worked and my typewriter (see how old this is) slid off my desk that was moving up and down like an ocean wave. I currently worry about the increase in tremors in Oklahoma that it's known they're caused by fracking. Anyway, I so love your books as they put a real face on animals and climate. And they all have a satisfying love story woven in. Roz, the same things are close to our hearts! You're so dear to me and it means so much that you've kept up with the series. My research included looking into the tremors/fracking in Oklahoma! And I can totally visualize your desk undulating like that. Creepy! Funny thing is, I was born in CA but left as a baby, so I the El Asnam quake in Algeria was the first I felt. When I did return to CA for a visit with family, it was to the San Fran area...right after the 1989 quake that sandwiched freeways. That horrible image has stuck with me since and I still get nervous being on an overpass or under one. We've had a few quakes in VA in recent years but they've all been fairly minor events. Thanks again for your kind words! Animals and the environment are very close to my heart and being able to weave them into a romance is a magical experience for me as a writer :). Wow! 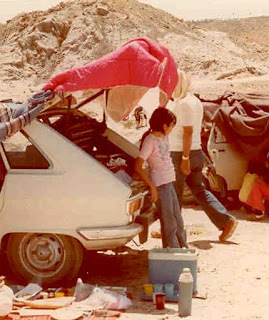 What exciting adventures you had as a child! No wonder your stories are so spectacular. My own adventures are woefully lacking and this series lets me go on an adventure. Thanks for the journey. You're very kind, LeAnne :). I will say traveling a lot as a kid was an education in and of itself. There's a lot to be said for experience! Hey May sister! I hope you had a great visit with your mom and a Happy Mother's Day :)! Don't feel sheltered lol...just travel in books ;). I haven't traveled nearly as much in my adult life as I did as a kid. Rula!! I meant to comment on this Saturday but I’d been having major Wordpress problems and couldn’t comment on blog posts for a while. Thankfully it seems to be fixed now. I was so excited reading this post!! And now I can’t wait to read The Twin Test!! Earthquakes. Yikes!! Thanks for this wonderful post. Hi Laurie! No worries! It's always great to 'see' you here, no matter when it is :). So glad you're excited about the book. I hope you enjoy it! In fact, I just found out the title for the final book of the series and it just went up for preorder on Amazon. It's called The Marine's Return, due out Jan 1, 2019. 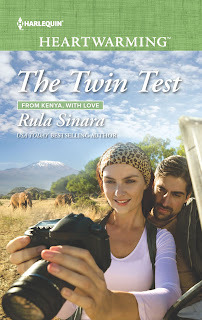 No cover yet, but I must say I love the cover for The Twin Test :). Thanks! Feeling tremors and quakes really is unsettling and strange. I can't imagine those who've survived the big ones.